Do you know if there is a way to create an instance of a flow dynamically? I would like write 1 class that my admins can tie to any report. The admins will set up metadata in the system (custom settings or custom metadata types) which will define the report name (or ID) and the flow that has to run with the results of the report. Based on the report, they would like to run different flows. I would like to read the metadata and dynamically instantiate the flow and run it with the parameters. Thanks! I am actually in the middle of building a packaged tool for this very purpose, it will be my second blog this month and the solution will be open source. I actually found a way to accomplish the defaults for your tests. I ran into a similar situation where I was unable to create a mock instance to my object. Once I remembered the ability to change a Map to an instance (like serializedUntyped), I knew it could work the same way. I tried this out in Anonymous Apex and I am able to construct what you need. Thank you! I’m so glad I can help someone who has contributed so much! Your very welcome, cool use case in your blog btw! Turns out, you can use JSON.serialize to create instance variables that are difficult to mock. Once I realized that I can change a Map into an instance of my choosing, it actually becomes pretty straight-forward. Is there a way to send an email to the user instead of creating a Task? I’m using a custom Action because the Subect and the body of the message needs to be customized, I created an apex class that implements a notification Action, just like you did and I pass the parameters to the Flow. Once I’m on the Flow, I don’t know how to tell the Flow to grab the parameters I’m trying to pass. What does your TaskReminder looks like behind the scene in your Flow? You can use the Email element in flow to send an email, i have also shared the flow definition for the TaskReminder so you an upload it into your org and take a look. Hi Andrew. Thanks for the post. I’m going to create a great tool for Admins to provide the ability to schedule record updates. Workflow only allows Admins to easily schedule one action but not a repeating action. My idea is to have Admins use the report engine to specify the criteria. Place the record id in the first column and a datetime field to update in the second column. Hi Andrew, Thanks for that. I built up the first draft, but have hit one major snag. It looks like the it only passes the first 2000 records of the report to the Apex. Does that sound right to you? Yeah that’s a platform limit. Anther thought would be to have them give a list view name and use the list view API to get the soql generated by the platform and use that to drive your batch Apex. Thanks for the post, this is awesome!!! I actually have a question related to this. Is there a way to identify which all reports are subscribed for report notifications (like chatter notification, email notification, apex execution etc..,)? I checked the Apex Analytics API and did not see it in the Report metadata. 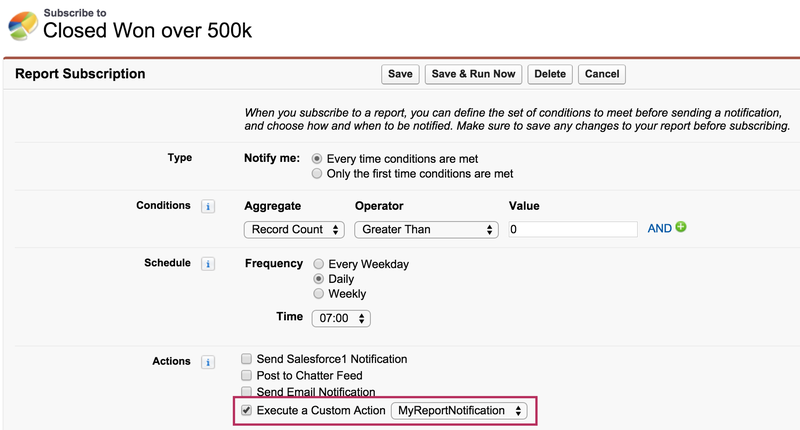 I checked the REST Analytics API and found this, https://developer.salesforce.com/docs/atlas.en-us.api_analytics.meta/api_analytics/analytics_api_notification_example_get_notifications.htm. Its worth setting up a report and retrieving its JSON via the Salesforce Developer Workbench and seeing what you can see.